Here's a short little clip of the girls ... they LOVE dancing. I'll try to get a better one, but everytime I have the camera on them they want to play with it so I never get any good shots. I've just figured out how to use my camera and upload to YouTube to add to my blog, so keep your eyes out for more short video clips of the rugrats. :) <-- Smile!! Here they are, though ... shaking their "booty" as they like to say! Thanks to everyone who is praying for Dave!!! It must be helping because we have good news! From what Sam told me, if the insurance company approves the transplant, Dave is strong enough to go on the transplant list. And once they put him on the list, he's apparently number one in line at the hospital for the organ!! It's too bad it all comes down to the fight with the insurance company (arrgh!) but hopefully it will all work out, and he will get a new and improved liver and will be back in good shape before long!! We're praying for ya Dave & Karen! Yippee!! Zach had his first lesson today ... and guess what? He didn't freak out, he didn't cry, he LOVED it!!! Here's some pictures of the little guy! Unfortunately, we overslept, so we ran out of the house without his helmet ... and his gloves!! (poor thing, lol!) He fell a couple times and he keeps saying how slippery the ice is! Here's some pictures and a short video of him skating. Heeehee! Very cute!! 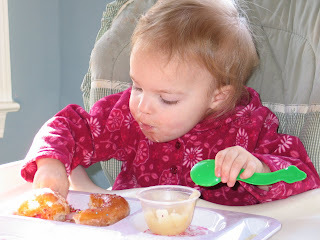 This is a post for my hubby--- because I think I sometimes forget to remind him how much I love him. Thanks to everyone who is praying for Sam's friend, Dave Slagle. Someone Up there is listening as Dave's condition is improving a little bit each day...and his doctors are hopeful!!! They're slowly taking him off the sedatives and his liver is starting to function somewhat, from what I understand. 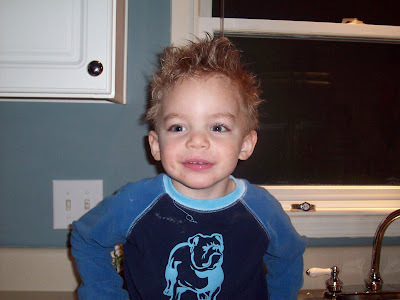 He needs to get well enough and strong enough for a transplant, and Sam told me that once he is strong enough he is number one at the hospital to receive the donor organ ... so that's great news. Please if you don't mind ... say a prayer for Dave's wife Karen. It's bad enough that she has to see her husband go through this, unsure if he will pull through ... not to mention she has to run the the business that they own on by herself so that they can continue to pay their bills ...but she's also having to deal with the awful bureaucracy of the insurance company now. Apparently she's fighting with them about the cost of the medication he will need to take monthly (several thousand dollars) for the rest of his life when he gets the transplant. I'll keep you all posted on Dave's condition ... we're praying for a speedy recovery! There is a severe organ shortage in this country. 17 people die each day waiting for transplants. As of this morning, there are 97, 972 people on an organ donation list. Check out: http://optn.org for more information and statistics. A new name is added to the transplant waiting list every 13 minutes. Most major religions with the exceptions of Shinto and Gypsies supports organ donation. Protestant, Catholic, and Jewish faiths, support organ donation as a virtuous and charitable act. Other religions view donation as a personal choice. Organs and tissues from a single donor can be used to benefit more than 50 people on the waiting list. 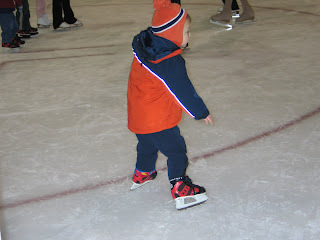 Well, I was hoping to post pictures of my little guy in his ice skates trying to stand up on the ice.......but Sam took him for his first lesson and it was cancelled because of a high-school hockey tournament the rink had scheduled! (Talk about disappointing a 3 year old........ we woke Zach up and he jumped out of bed literally ready to go he was so excited ..... he ate his breakfast in the car....and he couldn't even get on the ice!) Major bummer!! Funny story, though ..... They had to leave about 7:30 (they told me to be there by 8:00 so we could register and the class started at 8:30) ... and the girls were --- amazingly enough --- not up yet. When they finally woke up around 8:00 the first thing they asked was "where's Zachy" .... they then proceeded to look for him (in his room, by the TV, out the window) and they continued to ask "where's Zachy" for the next hour. Talk about separation anxiety! I thought that was sweet, though....they sure do love their big brother and they are obviously not used to him doing things without them. However, it was nice for Mommy, after we ate breakfast, the three girls snuggled on the couch with a book and (of course) one of their favorite TV shows on. We don't usually get "girl time" .... Zach usually likes to cut in on any snuggling if I am trying to cuddle with the girls (can we say jealous, LOL). DON'T DRINK FROM HOTEL GLASSES!!! Have you ever come back from a trip feeling sick? Blamed it on being in an Airplane, right? Um, yeah, probably not the case. Check this out and you will NEVER EVER EVER think the same. ALL I HAVE TO SAY IS UGHHHHHHHHHHHHHHHHHHHH! This is totally and completely unreal. Sam got some news this morning that one of his best friends from college (they were fraternity brothers) is in critical condition at a hospital in Pittsburgh. He has a serious blood infection from what I understand. Without going into too much detail, his friend contracted Hepatitis A a few years back snorkeling in the Cayman Islands, of all places. Apparently, he came in contact with raw sewage in an area that was supposed to be safe to snorkel outside of the resort where he and his wife, Karen, were staying and over the last few months he has taken a turn for the worse. He is now in intensive care due to this blood infection which caused by a minor injury. Karen apparently is working with doctors to get him on an emergency liver transplant list that could help save his life if he is able to pull through this infection. Sam hadn't kept in contact with his good friend over the years, and is really feeling very sad that he didn't. Let that be a reminder to all of us that even though we all have very busy lives, it doesn't take any time to drop an e-mail to our friends - old and new - just to say hello ... or pick up the phone ... or (and I know this is so.....out of style....kind of like, leg warmers or Forenza sweaters!) write a letter and send it through the MAIL (GASP!!)?? Needless to say, Sam got in contact with many people today that he has not talked to in years - and it's unfortunate that is what it took to reconnect them all. Anyway, just wanted to ask all of our praying friends and family if you could send a prayer up for Sam's friend, Dave Slagle or put him on a prayer list at your church. I know Dave and his wife Karen could really use as many prayers as possible right now. We are truly hoping that he pulls through. I read online today that if you are travelling to the Caribbean you should tell your doctor to get a Hepatitis A immunization. Honestly, I would have NEVER thought of this in a million years. Apparently it is very important to get this immunization especially when travelling anywhere south of the United States and Asia. I read that Hep A is one of the most common vaccine-preventable infections acquired during travel ... so please - if you go - get the shots! 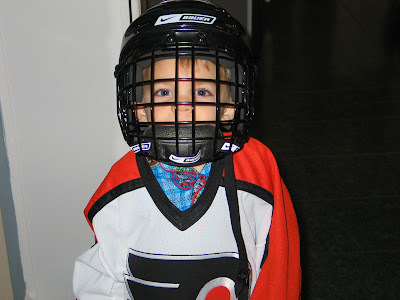 Daddy got Zach his first hockey helmet today! He is SOOOO cute in it!! He starts ice skating / pre-hockey this weekend and the instructor said that they recommended kids wear a helmet for protection as much as it gets them used to wearing it. Here's some pictures of our little guy in his first piece of sporting equipment (but I've got a feeling it won't be the last!) 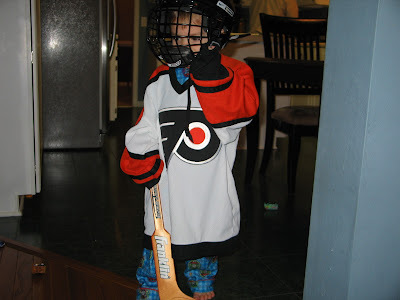 Note, it was only really "not scary" to put this big helmet / cage thing on when he had a "stick" and a team (which is what he calls his Flyers jersey) on over his Thomas PJ's. It will be interesting to see how he does on Saturday - since they won't be using a stick/puck for awhile, I presume he'll have no need for the cage for now...though it does make for good protection against his sisters! Heeheee!!! Have a good night everyone......I'll see you all another day! Finally, a picture of the FIVE! 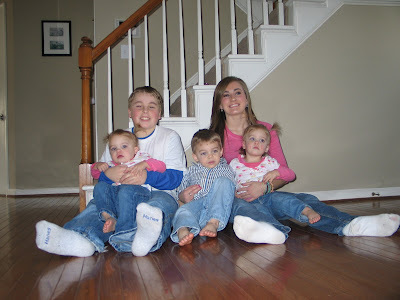 If y'all had any idea how hard it is to get 1 kid to sit still for a picture, try multiplying that times 5. Here's about the best photo we could get of the five kids together. Not "great" but by far the best we've come close to getting! We've never had the girls pictures taken professionally - we're going to be *hopefully* doing that in the next couple weeks. I'll keep you updated on how that goes!! As you all likely know, I used to use my Kodak Gallery website to post ALL of my photos. I did for a couple of reasons. First, I was able to easily share my photos with our friends and family around the country. Second, this was a GREAT back up in case something ever happened to our computer (such as a virus or crash) you can buy a back up of all your photos. Since I'm a photo junkie, I couldn't bear the the thought of ever losing one of my photos! So I used to just dump all the photos off my camera into Kodak and then give everyone the link. I'd take out the really bad pictures, but if I wasn't "sure" which pictures I wanted to print (if there was 5 or 6 of the same pose, for example) I'd just save them all - which usually meant everyone had to look through 200 pictures once a month. I discovered a few things over this last year. First, a decent backup hard drive is like $80.00. It's small, portable and overall a GREAT investment. I just back up on there every week or so...and if I have a problem...I've got something to work with. Second, I started blogging - which is not only FUN but it is really a way for me to just.......unwind .....and tell you all a little about what is going on in the busy Tramontana household. (Just in the slightest chance you might actually want to know.) <-- smile!! Last, I started scrapbooking this past year. I realized that I was saving photos that had NO BUSINESS being saved. 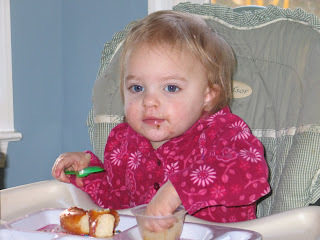 Like will Zach REALLY ever want to see TWENTY-FOUR pictures of him eating his first meatball? Seriously! 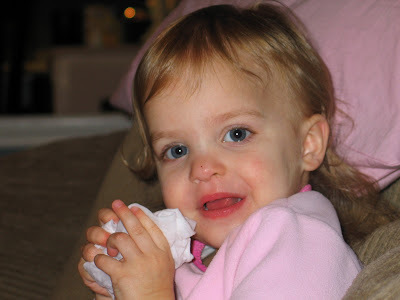 This year, my goal (and I just did this with my first batch of 2008 photos) is to delete any picture that is really not worthy of framing, blogging or scrapbooking. Anyway, enough about that. Here's some "random" photos of the girls from the last few weeks. Thought you would enjoy! 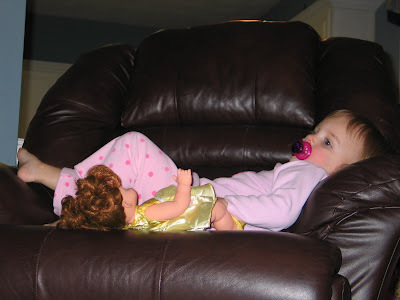 Addie getting cozy on the recliner with "Belle"
Playing cars with Sissy on the Princess table. 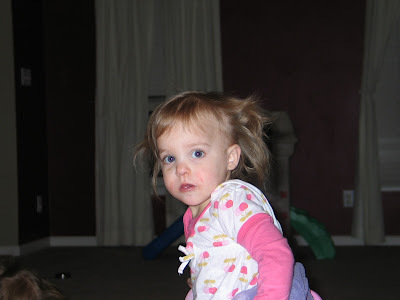 Picture of Addie with her curly hair...she looks like such a toddler ...she is so losing that baby look. *sigh* .... They grow up too fast!!! 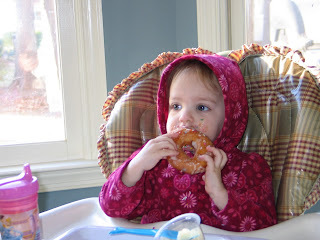 Daddy brought the kids home Krispy Kreme donuts with sprinkles for breakfast as a rare treat a few weekends ago. 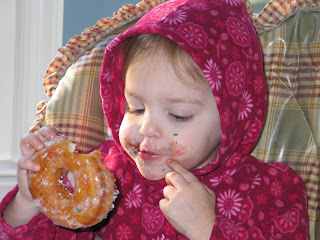 Let's just say they devoured *some* of the donuts and *most* of the sprinkles! Hmm....which color sprinkle do I want next?? 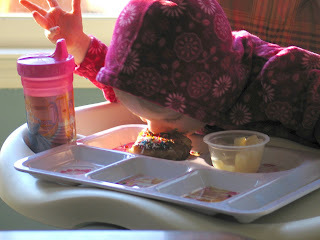 Umm, I guess we'll have to work on our table manners? I swear we don't have a dog!!! Mmm, this was a yummy treat dad!!! 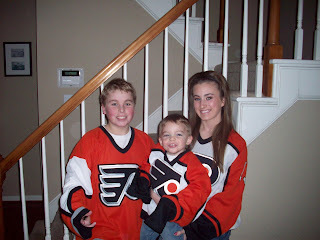 Just an update .... Zach starts pre-hockey (learn-to-skate/play) on Saturday. This first 8 weeks will concentrate on learning to skate, etc. 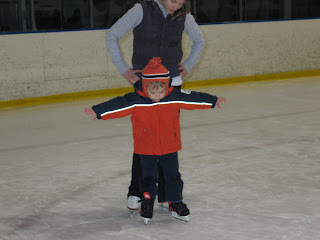 The next session of 8 weeks concentrates more on the technical aspects of skating, and then he will become a "mini-mite". Wait a minute, I just thought of something. I'm going to have to check this out. They don't teach them to start checking at 3 or 4, do they? They don't do that until they're like 12......right? 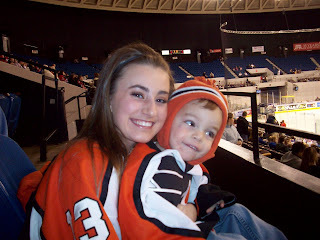 I won't be able to handle my baby getting smashed into the boards just yet! :) Heeeheee! 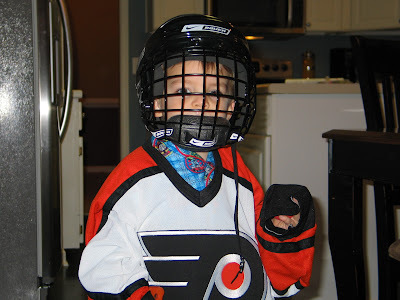 Will post photos of him on Saturday - Daddy is going to take him to get a hockey helmet this week - they recommend that he has one in case he falls. I don't think he won't be using a stick or a puck or anything like that for awhile. 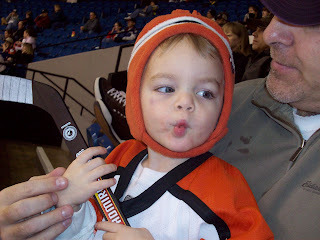 Daddy said he's going to get him a (real) Zach-size stick, too ... so he can be like his big brother, Ben! LOL! Have a great day everyone, and pray that Zachary has more coordination than his Mama! So anyway - yes, we signed him up for his first organized activity. I really can't believe it. We're not sure if he is mentally ready (lol) but physically the kid can run like the wind (Daddy always calls him Dash - like the little boy in the movie Incredibles.) Plus he can kick and run with the soccer ball ... so we think he's going to be fine for that part. It's the whole "following directions" that we think he might have a problem with. We'll see what happens - I'll keep you posted!! Oh, and Daddy is going to be the Coach! That will be exciting!! Mommy, Addie and Avery will of course be the cheerleaders from the sidelines!! :) Go Zach!!! Tonight I was laying in Zach's bed with him....telling him for the hundredth time (tonight) why he needed to go to sleep and he was asking about the stars we were looking at through the window. I told him that they're in outer space with the planets and that he can make a wish on them if he wants (I didn't mention that I had already wished on one that he would *please, please please* go to sleep!!). Anyway, he asked if I could get one for him, and I replied "oh no honey...they're up to high for me to reach." Ever the problem solver, he thinks for a minute and says "no problem, Mom, Daddy can stand on the ladder and get one." I said "honey they're even too high for Daddy to reach on the ladder." He thought about this again and said "yeah but he has really long arms!" Just thought I'd share what I thought was a cute...and sweet....story. Okay, I don't want to sound like I'm bragging or anything (yeah, okay..so I do!!) ... but my husband really produces talented kids!! 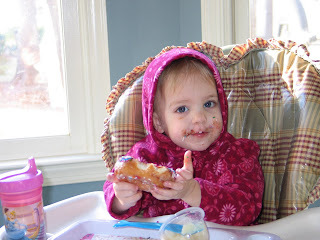 I can only imagine what is in store for Zach, Addie and Avery, though with my lack of grace...who knows!!! (Just kidding! lol!) Attached is a link to a photo album of two of Kayla's recent dances. I'm sure you will agree ... she's incredible. So incredible, in fact, that she has an audition at Julliard next month for their summer intensive program!!! The program is a one month session aimed at giving Junior and Senior students a "look into the life of a Julliard student" since she is very interested in continuing her dance career through college ... and her dance studio has recommended she apply to Julliard - she is that talented! Go Kayla!! In between dancing, Kayla finds time to get good grades and spend with her frieds TEXTING and doing all the other things 16 year olds do - including drive (did I mention she has her driver's license now??) She also has a boyfriend (Kory) --> pictured below. We wish her tons of luck next month at her audition in Chicago which takes place at the Hubbard Street School of Dance!! 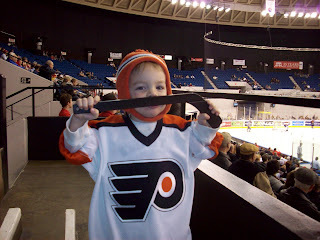 And speaking of hockey .... Ben is apparently the future Wayne Gretzky!!! Back home in Minnesota, he plays for the Anoka Tornados (Squirts). He has scored 21 goals and has had 5 assists. In only 19 games so far this year. He is the leading scorer for his team!! WooHoo! A 3 year old and a bottle of hairspray?? 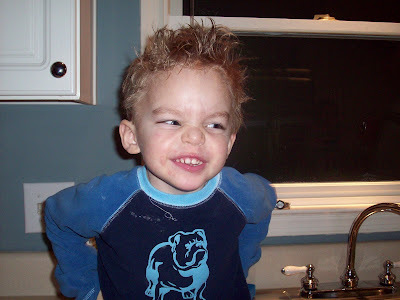 What do you get when a 3 year old finds his big sister's two-thirds full bottle of hairspray, when everyone thinks you're supposed to be sleeping? You get hair that "hurts". At least that is what Zach said when he came down stairs at 10:00 PM Friday night. Kayla isn't used to putting her things up high. And by up high I mean high enough that her little 37inch brother standing on top of a bucket can't reach an enticing looking bright green can of spray! Addicted to TOY shopping. Yes, you read that correctly. TOY shopping. (Oh okay....Apple Martinis too, but ya'll already knew that!) <-- Smile! Ok, so I'm trying to reason with myself here. Some women are addicted to shoe shopping ... or they spend all kinds of money on expensive clothes or makeup, right? I don't really do all that ... but I am addicted to buying toys. Literally the day after Christmas we were at the mall to get some clothes for the kids and I'm like let's go into Disney...great sales going on in there! 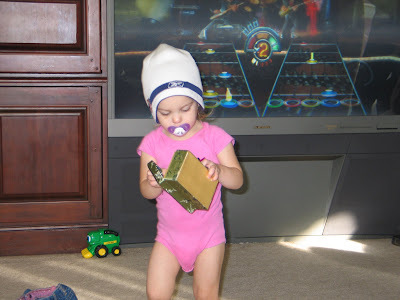 (Mind you if you read my post for Christmas you will have read how miserable my kids were with all their new toys....too many new things all at once is my theory!) Anyway ... as you all probably know, Zach's been into the movie CARS for like ever now ... and he has been collecting (okay, WE have been collecting......alright, Sam....lately I have been collecting!!!) the little die-cast cars for awhile. I just took inventory. We have 74 of them. I mean, we literally have just about every single one that you can currently purchase. Not every one ... but pretty darn close. 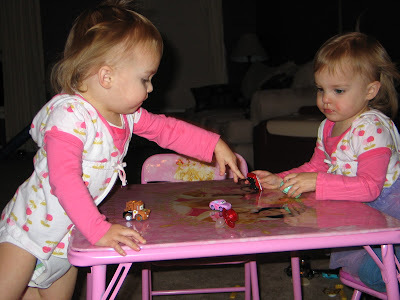 Is there some twelve step-program for mom's who can't control the urge to buy toys? I mean it's a week after Christmas for goodness sake!! I've bought Zach two monster trucks and a CARS race-track for these little "Adventure" cars - which I haven't even mentioned (and we have all of, by the way, LOL!) The thing is....he has so many and he gets them all the time ... he could care less when he gets one. BUT I CAN'T CONTROL MYSELF ... I HAVE TO GET THEM. When a new one comes out ... I will go to EVERY Target, Wal-Mart, Toys-R-Us, etc. to see if they have it. Literally, I have driven to three different stores in ONE DAY to see if they had the "newly" released cars. It's like I'm the one who is addicted to getting him all the cars in the collection - he doesn't even know they exist. Someone please STOP ME!!!!! (Please note: I was at Toys R Us this weekend with Kayla - they had two NEW cars that we DON'T have - the Pace Car and a new "Lightning" Ramone ... my heart started beating fast and my palms were getting sweaty at the prospect of the new cars ... but Kayla (always the sensible one) talked me out of buying them. I actually walked out of the store and I was so pleased with myself. 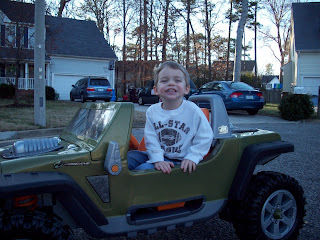 But in the next store, the store we ran into JUST to get tape (Wal-Mart) I bought him a CARS Racetrack. Oh gosh, it's out of control. Anyway, here's the list of the one we have. I figure "coming clean" is the first step of any program, right?? (smile!!!) Holy cow!!! This is an image that will live in my memory for awhile ... we went in to check on the girls and one of them (not sure which) was sound asleep (UNDER) her crib. I HAD to grab the camera ... Sam was afraid it would wake them up ... but I said you don't get photo ops like this very often. 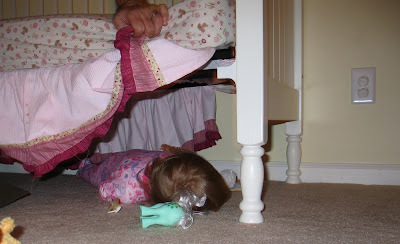 The sleeping in "big girl" beds is NOT going very well. The night this picture was taken they were up all evening long and so by the time they finally fell asleep (well past 10:30) we just left her there for fear of waking her up. We've since had to put all their toys in the closet. And tape the closet shut. (We've already had to move one of the cribs in front of the dresser so they don't open the drawers and take all the clothes out.) They like to jump on the beds, play and they usually end up falling asleep in the same bed together (which is actually rather cute, I must add.) Pray that it gets better for us. The girls actually have circles under thier eyes...lol! Anyway - Kayla and Ben are here for the week, I just wanted to get this post up because I thought it was such a funny picture. Enjoy and hope everyone had a Happy New Year!